The Russian President has signed the much disputed set of amendments to the administrative code that increase the fines for illegal rallies 150-fold and introduces more regulations over street protest. Putin announced that he had signed the bill as he spoke at the conference dedicated to the development of the Russian court system. 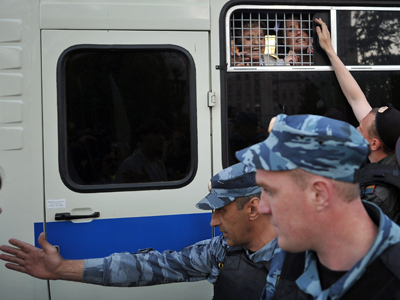 The head of the Russian state told the justice officials that they “should apply the new law in such a way that it does not limit the citizens’ right for expression over any issue of internal or external politics, including street marches, events and rallies”. 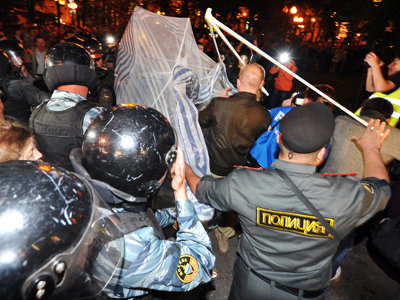 At the same time, Putin stressed that the protests “must be organized in such way that they inflict no damages to other citizens, who do not take part in them”. Putin reminded the audience about last year’s events in Great Britain “when it all came to mass riots, torched cars and robbed stores”. “As the society guarantees the right to express their opinion, including by street events, to some of the citizens, it must protect other citizens and the society as a whole from radicalism,” he said. The President asked the justice officials to study the law and submit suggested changes if they are needed. “Nothing we have is frozen solid. If we find out the MPs have missed something, that something must be laid out in a different way, you are welcome, we can approach the State Duma deputies, look at how the law is applied and ask them to make some corrections. 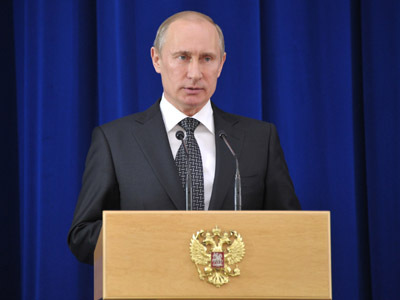 If there is such a necessity,” Putin noted. The new law raises the maximum fine for ordinary citizens found guilty of participating in illegal street protest to 300,000 roubles (about $9,000) from the current 2,000 roubles (under $70). 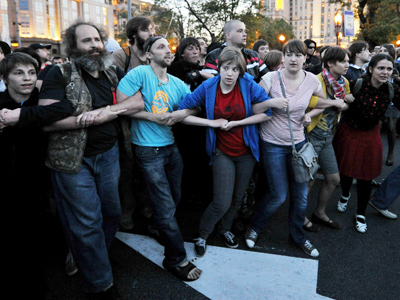 Meanwhile, the fine for officials will increase from the current 50,000 to 600,000 roubles ($1300 – $20,000).The bill allows individuals the option of performing up to 200 hours of community service instead of paying the fine, which may prove exorbitant for some protesters. However, the maximum fines are applied only in cases when the protesters cause damage to health or property of other citizens. Ordinary violations are punished by much smaller fines – from 10,000 to 20,000 roubles ($300 – $600) or an administrative arrest of up to 15 days. Furthermore, the new law makes it illegal for protesters to conceal their faces at rallies, as well as some other adaptations to the law that aims to make the life of illegal protesters more difficult. Former Soviet President Mikhail Gorbachev called Putin’s decision to sign the bill “a mistake”. He did not rule out that it would have to be corrected. Senior member of Liberal-Democratic party (LDPR), Igor Lebedev said such a decision was “absolutely expected.” “I don’t think that protests will increase,” he told Interfax. The LDPR voted against the controversial law. According to Sergey Mitrokhin, the leader of liberal Yabloko party, the law is “in fact a ban on holding rallies and political actions.” He added that now everyone comes under fire – organizers of such events and activists. However, Yalboko is not planning any protests against the law in the near future. “Now anyone can be punished with slave labor or a crazy fine. I can’t gather people for a rally knowing that they might be sent straight to the galleys from there,” Mitrokhin stated. The head of the Presidential Human Rights Council, Mikhail Fedotov said the consequences of the adoption of the document might be grave. Everything will depend on the way the law is enforced, he said, adding that he hopes the usage would be “moderate.” The Council Chairman stressed the law needs to be seriously improved. Earlier, the body issued a statement saying that the draft law violated the Russian constitution and other laws and said that they would ask the President to veto the bill. Meanwhile, the head of the State Duma Security and Anti-Corruption Committee Irina Yarovaya stressed that the law on illegal rallies is aimed at providing public safety as well as protecting the lives and health of Russian citizens. After being signed by the President, the law has to be officially published. Putin’s spokesman Dmitry Peskov said it published in the government daily “Rossiyskaya Gazeta” on Saturday and the majority of its clauses will come into force immediately after that.